Rivea is the new restaurant from chef and restaurateur Alain Ducasse, who has chosen the Bulgari Hotel & Residences, London as the setting for his informal restaurant inspired by the vibrant food markets in Italy and Provence. Located in Knightsbridge on the edge of Hyde Park, London’s Bulgari Hotel is both a haven of calm in the centre of the city and yet under a minute’s walk from such landmarks as the famous Harrod’s department store. Since opening in 2012 the Bulgari has set new standards among the luxury hotels of the British capital. Elegant contemporary architecture and Bulgari’s legendary flair for design are matched by class-leading quality of service. 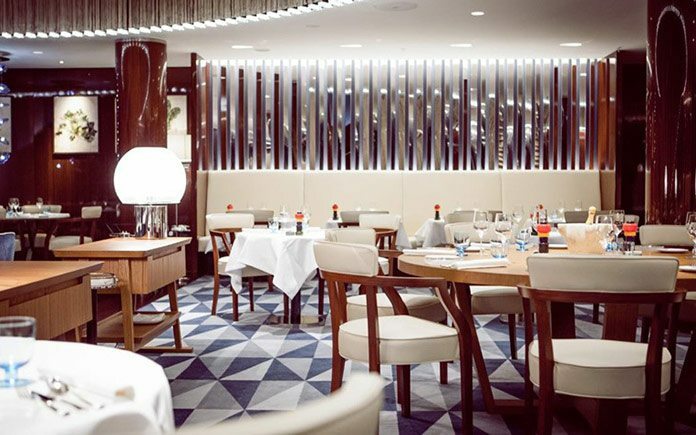 At the new, 82-seat restaurant, Ducasse is cham-pioning the talents of his protégé Alexandre Nicolas, who has worked with him for more than ten years and who shares his passion for the Riviera’s fresh and healthy cuisine. Alexandre is at the helm in the kitchen and has developed a menu of small plates that expresses the flavours of the Mediterranean palate through the Ducasse culinary philosophy. The elegant yet laid-back dining room has been designed by noted Italian architect and designer Antonio Citterio Patricia Viel and Partners. A display of produce, showcasing some of the chef’s favourites, brings colour to the room. Jars filled with preserved lemons, artichokes and pasta sit next to fresh vegetables, grissini and breads whilst homemade chocolate and hazelnut biscuits wait to be gifted to the diners at the end of their meals. The spirit at Rivea is relaxed and convivial. Informal yet impeccable service is overseen by experienced Restaurant Director Nicolas Jaouen, with staff echoing the restaurant’s casual and chic nature, wearing canvas sneakers. For more than 25 years, Alain Ducasse has worked to express the myriad of flavours from the Mediterranean region, between inland Nice and Liguria by combining the regional traditions of that delicious land with gastronomic expertise and local produce, conveying a tangible sense of terroir and supporting local artisans. The Mediterranean is his core source of inspiration and his adopted homeland. The produce, climate and people embody the local ‘art de vivre’ so dear to Alain Ducasse who has spent much time discovering the culture of French and Italian Riviera cooking, exploring the lively markets, listening to conversations and finding inspiration for many of his recipes and his ways of doing things. Alain Ducasse has visited many markets around the world gaining inspiration, from Morocco to Colombia to San Sebastian. A favourite of his is the Cour Saleya Market in Nice where seasonal fruits and vegetables come in unique and rare varieties, local fish and cheeses are available all year round, and the popular street food socca is made. It is a thin crêpe made with chickpea flour, olive oil and water, fried until crispy. At Rivea London, Alexandre offers his own take on the socca, combined with another iconic recipe from Nice: he fills the socca with ingredients from a Niçoise salad – French green beans, tuna, fennel, baby gem, black olives, quail eggs, spring onions, tomatoes, parsley and basil-all seasoned with olive oil and lemon juice. Alain Ducasse and Alexandre Nicolas have enlisted the help of artisans and specialist famers to create a menu of Riviera-style dishes using the best of both British and Mediterranean produce, bringing an expression of this essential cuisine. The charcuterie comes from the famous Spigaroli brothers – Italian artisans whose family have been making their cured meats for more than 100 years. Their much-prized Culatello di Zibello – a slowly cured boneless ham made from the upper hind legs of the pig was once a favourite of the famous composer Giuseppe Verdi. Their San Daniele and Culatello, presented together on a board are the perfect accompaniment to an aperitif. Olive oil and Taggiasca olives are sourced from Terre Bormane – Italian producers of fragrant, dainty and natural oil with a Ligurian tradition. In addition, homemade offerings such as breads change according to the seasons and Pastry Chef Alexandre Talpaert’s inspirations, and include a light and delicate lemon bread and a homemade focaccia prepared with a deep savoury black olive paste. Amongst the signature dishes, the tigelle, a round Italian bread made with cream rather than butter, is filled with cured ham or rocket salad and pesto, and then toasted like a Panini. Further Rivea signature dishes include baked John Dory, which is cooked in a fragrant, bouillabaisse style fish soup thickened with pureed lemon, served with silky braised fennel, olives and sweet sun-blushed tomatoes. A Cookpot of vegetables ‘from our farmers’ offers a delectable taste of terroir and season. During the spring, it is an earthy, fondant-type base of roasted celeriac, turnip and mushrooms topped with a layer of fresh, al dente courgette, radish, green pea and beetroot, all cooked gently together in olive oil. Rivea’s pasta recipes offer some new takes on the old time classic. Made fresh by Alexandre and his team on a daily basis, they include cloud-like raviolis stuffed with seasonal vegetables. In spring and summer Alexandre’s carefully handcraf ted herb pasta, is served with green asparagus and morels. The chef presses leaves of chervil, flat leaf parsley and tarragon into the sheets of pasta whilst rolling it out, embedding them into the pasta. Pastry chef Alexandre Talpaert’s dessert selection reflects the Riviera sensibility whilst incorporating a British twist. His lemon shortbread with limoncello sorbet celebrates the sweet, aromatic freshness of Amalfi lemon, whilst nodding to the iconic British treat of shortbread, topped with lemon marmalade, shrouded by a dome of creamy lemon curd and gems of French meringue. Chocoholics can opt for decadent chocolate based creations made with Alain Ducasse’s own chocolate from his ‘bean to bar’ Manufacture in Paris. For those preferring a cheese course to end their meal, a selection of the best British goat cheeses is on offer, keeping with the Provençal theme but drawing on the fine cheese making heritage of the British Isles. The wine list, created by Alain Ducasse Wine Director Gérard Margeon and Head Sommelier Sam Heathcote, features small, artisanal and upcoming producers alongside iconic winemakers. It is very much a reflection of the menu with a focus on wines form Provence, Corsica, the South of the Rhône Valley and the French & Italian Riviera. The wines by the glass and carafe are available in different size formats including rosé from Provence exclusively by the Jeroboam. The list also incorporates fine wines from Bordeaux and Burgundy as well as Italian classics. Bottles of wine start at £25, while wines by the glass from the list range in price from £7 to £18. Bespoke Rivea cocktails and aperitifs are ideal to start a meal, along with a charcuterie board or the signature tigelles and socca. Based on Provence wines and the iconic anise-flavoured liqueur Pastis, the cocktails have been designed to reflect the art de vivre of the Riviera whilst incorporating a touch of creativity. Fruity, refreshing, and fragrant with Provencal herbs, they include a Pastis take on the mojito, with cucumber, mint and crushed ice, or white wine with orgeat syrup and thyme liquor. Alain Ducasse is known for his attention to table and cookware, with crockery that reflects each individual restaurant’s identity. Rivea’s diverse collection of tableware brings colour and vibrancy and conveys a sense of accessibility. The collection allows the kitchen and front of house team to play, mix and match with the items according to the dishes and menus. The artisans and design houses providing the sets have all been selected for their superb quality, heritage and working ethics, as part of Alain Ducasse’s continuous support for French craftsmanship. The items include a range of rustically chic, simple ceramic plates and bowls by Jar, in soothing, neutral tones, and bespoke ‘Rivea’ plates by Soins Graphiques for Pillivuyt, which Ducasse has worked with before on the development of his ‘Cookpot’. More quirky is the seaside inspired glassware by Finish designer Iittala, which also provides Bayadere style striped pieces to reflect the spirit of the Riviera. Charming, bespoke embroidered napkins sport vegetable designs that encapsulate Rivea’s cuisine. Renowned Italian architect and designer Antonio Citterio Patricia Viel and Partners has created a space of breezy, laid-back elegance which captures the beauty and relaxed nature of the Riviera. The restaurant retains a sense of light, space and a decidedly calming nautical character thanks to its soothing tones of blue and pearlescent cream. An undulating hanging curtain made from shimmering silk channels the gently lapping motion of the Mediterranean sea, while polished wooden floors, pillars and wall panels hint at yacht-chic. A mixture of tables and seating, from chairs to sofas and banquettes give the room an interesting and informal energy. A private dining room seats up to 12 under chandeliers of blue glass lotus leaves seemingly floating in the air. The space offers privacy and gives guests the chance to experience Rivea’s cuisine with a feast of dishes specially selected by the chef.